Granada Residences: A cluster of eight one and two-story stucco houses. All the houses are different with staggered setbacks, yet unified by connecting metal doored stucco garages and by their similar scale. 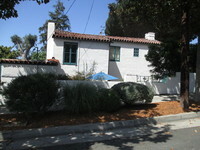 Each has a red tile roof (flat, hipped, and gabled all exhibited) and combinations of double hung and casement windows painted Santa Barbara Blue or white. 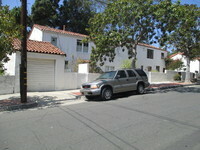 Situated on the corner of Nopal and Figueroa Streets, this one-story house has an enclosed one-car garage attached. The roof is flat wth a hipped section over the garage. 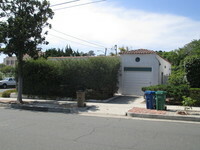 A circular window is centered over the garage. 42-inch diameter eucalyptus tree standing approximately 85 feet high and is the last remnant of Judge Charles Fernald's home and elaborate garden. 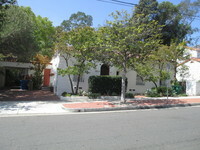 Located on the East side of the 400 block of Santa Barbara Street. 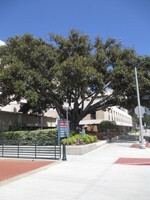 A large Moreton Bay fig tree, a specimen native to Australia. Large buttress roots and canopy. 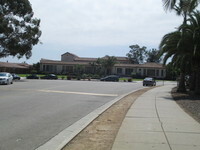 Located in front of the Reeves wing. 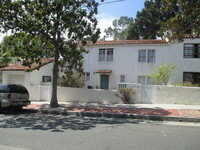 A cluster of nine one and two story white stucco houses. The houses vary in plan, and have staggered setbacks, but are unified by their red tile roofs, similar scale, and the uniform wood double hung and casement window designs. 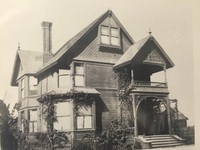 The Edwards House embodies Queen Anne characteristics in its steeply pitched roof, the irregular shape with a dominant front-facing dormer, patterned shingles, cutaway bay windows, and asymmetrical façade with an ornate two-story decorative porch. 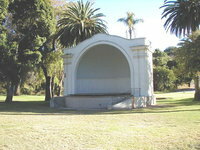 The band shell has elements of the Mission Revival style. It has two sets of stuccoed pilasters, one on either side of the great arched proscenium. 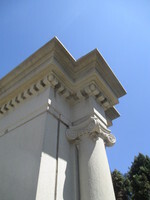 The molding around the opening, the cornice moldings, and the molding of the parapet are of wood. The structure is of stuccoed wood frame construction. 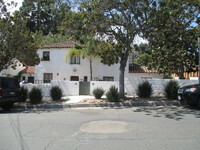 A one story recatngualr adobe and brick structure with medium gabled tile roof. The roof slopes to a shed on the east side where a brick addition was made in 1930. Only two rooms are adobe. It has thick walls and a recessed entry and windows. The north wall was rebuilt after the 1925 earthquake and is now buttressed. The structure is covered in stucco. The fountain consists of a vertical slab placed at the center edge of a semi-circular bench. A lion's head was the source of water which streamed into the horses' trough basin at the front of the slab. A non-functioning fountain for people is on the opposite side of the slab. 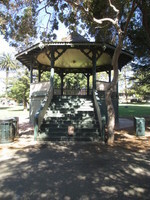 The octagonal bandstand has octagonal roof with carved supports under the wide overhange. The peeling composition roof has a scalloped edge. A rasied floor 6 feet fromt eh ground is served by an 8 foot wide stairway. 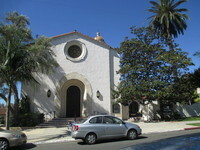 The L-shaped, Spanish Colonial Revival church has an octagonal open belfry with wrought iron decorative railings, cast stone scrolled volutes, blind arches, and a ridged dome rising above the corner. A terra-cotta tile roof and smooth stucco walls with deeply recessed openings form a backdrop for the original courtyard with a fountain. The sanctuary is located in the east wing with a dramatic entrance of a pair of intricately carved wood plank doors. A symmetrical two-story stuccoed structure with one story wings on either side of the slightly recessed main building. 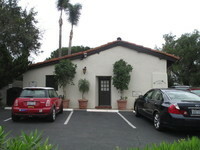 The red tile roof is hipped with a masonry chimney on either side. Fenestration includes large multi-light windows that open onto shallow metal balconies on the first floor. On the second floor are two multi-light french doors that open onto a terrace. At the center of the building is the glazed wood panel door deeply recessed in an arch. The Live Oak Dairy building has the following character-defining features of a Streamline Moderne building: •	the one-story with horizontal emphasis; •	the white predominant color; •	the corner entry and windows accented with the rounded flat metal awning and round, fluted pilasters; •	the ribbon band of glass block windows; •	the flat roof; •	the smooth wall finish; •	horizontal vectors and lines and the rounded awning at the front entrance. This is the Plaza del Mar Band Shell. The foundation and decking are made of concrete while the structure consists of wood frame covered by stucco. Decorative twin Tuscan columns flank the stage. A shaped parapet with coping caps the edifice. Circular metal plates line the underside of the roof of the band shell. Iron railings flank steps leading up either side of the structure onto the stage. A wooden access door inside the shell itself is secured with a padlock. Two vents are the only features on the side and rear of this structure. 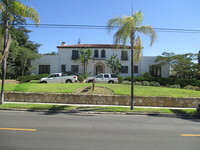 This two-story wood frame Italiente house has a bay projecting slightly from the right. 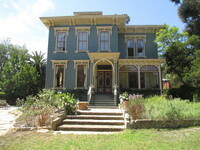 A tow-story slanted bay is centered in this bay, there are simple pilasters in the second story, and the first and second stories of the bay are separated by bracketed cornice. A porch has a spindlework balustrade and is supported by small pillars raised on a solid balustrade wall. At the top of the house's hipped roof is a cupola with delicate brackets and projecting eaves. 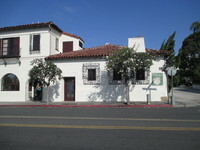 Two-storied stuccoed building with a gabled red-tile roof. 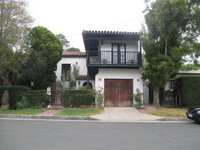 A front section exhibits a hipped red-tile roof, supported by wooden beams, that projects out over a balcony, which wraps along the second story on the south elevation. Granada Residences: A cluster of eight one and two-story stucco houses. 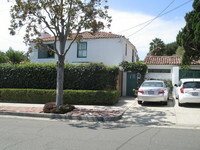 All the houses are different with staggered setbacks, yet unified by connecting metal doored stucco garages and by their similar scale. 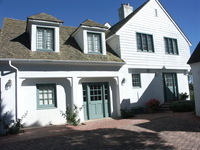 Each has a red tile roof (flat, hipped, and gabled all exhibited) and combinations of double hung and casement windows painted Santa Barbara Blue or white. A two-story residence, this house extends to its southerly lot line. Its garage is contigous to the garage of number 1111. 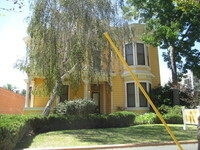 Hipped roof; double hung and casement windows painted Santa Barbara Blue.